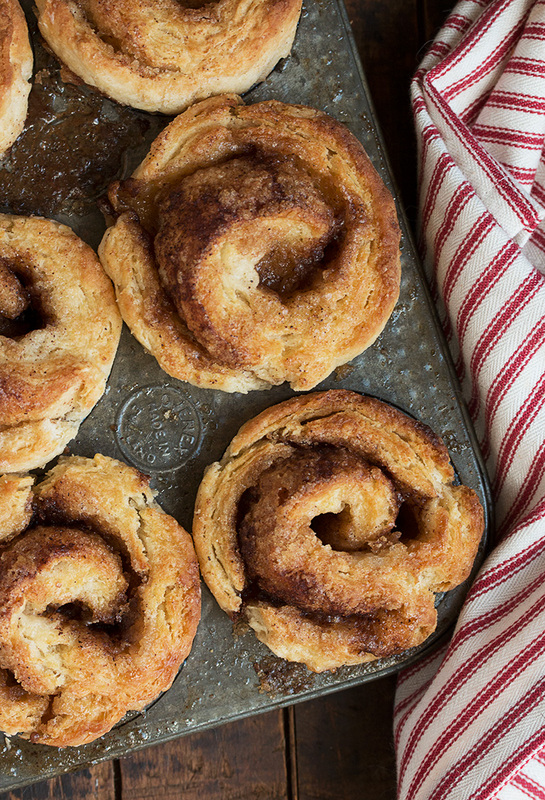 Want to enjoy all the flavours of cinnamon rolls without yeast? 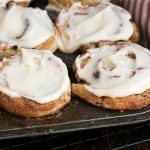 These Cinnamon Roll Ragamuffins are a quick and easy buttery biscuits, rolled with brown sugar, butter and cinnamon and topped with a cream cheese frosting. These lovely little cinnamon roll biscuits are just the thing when you want the flavours of a cinnamon roll, without the yeasted dough and the hours of rising time. 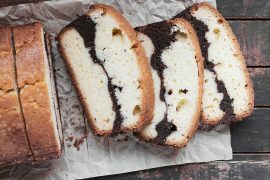 These are great for any time of day and are delicious both with or without the cream cheese frosting. If you’re a regular reader, you may remember my first offering of ragamuffins this past Spring, when I made maple sugar ragamuffins. I took that same great flaky biscuit dough and rolled it up with a classic cinnamon roll filling of brown sugar, cinnamon and butter. I was originally going to stop there, but in the spirit of go-big-or-go-home, I topped them with a generous swirl of cream cheese frosting. 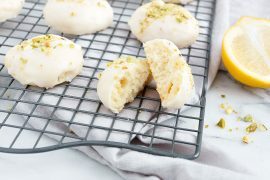 These biscuits are lovely on their own, so if you don’t feel like frosting them, trust me, you will still enjoy these, especially for a morning or mid-afternoon treat. As these are biscuits, they are best enjoyed on the day they are baked. If you can’t enjoy them all right away, they freeze beautifully. 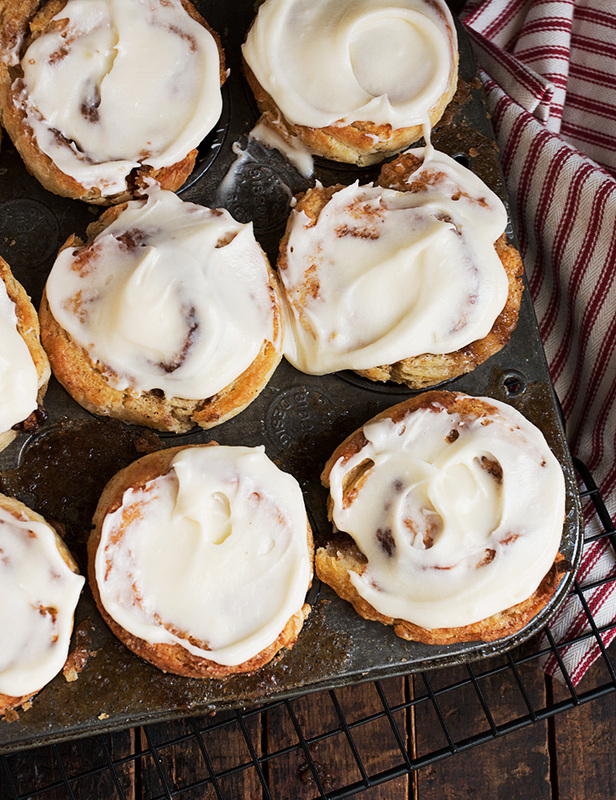 All the flavours of cinnamon rolls in a biscuit! 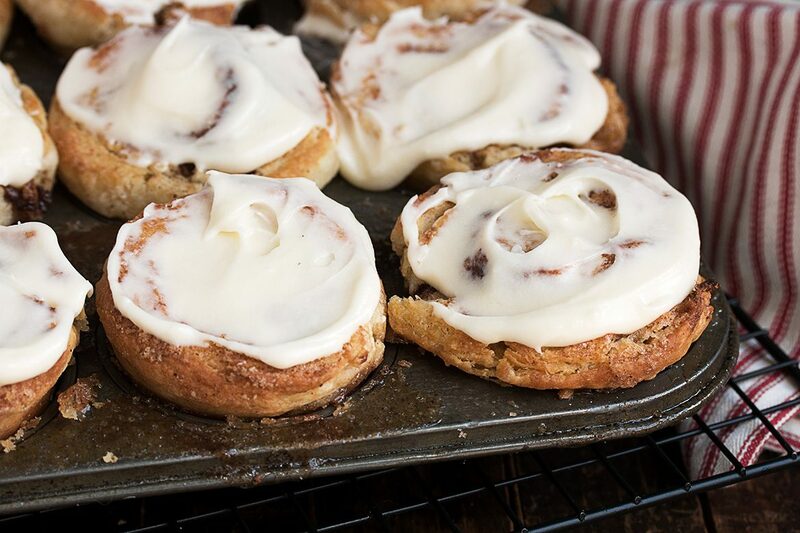 (No yeast required :) Enjoy these frosted with cream cheese frosting or plain, for a lovely morning or mid-afternoon sweet. Combine the brown sugar and cinnamon for the filling in a medium bowl and set aside. In a large bowl, whisk together the flour, brown sugar, baking powder and salt. Blend in butter with a pastry cutter or two knives until the mixture resembles coarse meal with some pea-sized pieces of butter. Add milk and stir with a fork until a shaggy dough forms. Gently knead dough 8 to 10 times with floured hands on a lightly floured surface. 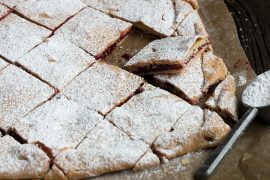 Roll out dough on a lightly floured surface with a floured rolling pin into a 13 x 11-inch rectangle. Spread softened butter evenly over the dough and then sprinkle all over with brown sugar/cinnamon mixture, pressing firmly on the filling with your palm to help it stick to the butter. Beginning with one long side, roll up the dough tightly, jelly-roll style. Trim both ends slightly, to remove any uneven part of the roll, then cut the roll into 10-12 slices with a sharp knife (about 1-inch wide). Place slices cut side down in prepared muffin cups. Gather any brown sugar from your work surface and sprinkle on top of rolls. Fill any empty muffin cups 1/2 full with water, to ensure even cooking. Once cooled, prepare the frosting by combining all the frosting ingredients in a small bowl and stirring well until smooth and a nice spreading consistency. (Add additional milk if too thick or additional icing sugar if too thin.) Spread frosting on top of cooled rolls. Do you think these would be OK assembled the day before and refrigerated then brought to room temp in AM and baked according to directions? Thank you. Hi Nancy and thanks :) I have never actually done this, but my gut says it should be fine. As long as you keep the butter cold throughout (ie quick into the fridge after you shape), I think this would work. Just about to make these and wanted to let you know the steps for making the frosting are missing. All good though, I think it’s pretty straightforward! All good! They came out perfectly and taste sooo good! Anything that can cut out the time involved with yeast is a winner for me. I love cinnamon rolls but rarely take the time to make them. This inventive recipe looks great and I can’t wait to try it. Thanks Celia and I think you will love this quick and easy version :) Enjoy! I’ve heard of ragamuffins, but I’ve never tried one. Clearly I am missing out because these look FABULOUS, Jennifer!!!! I mean, ALL of the deliciousness of a cinnamon roll without the need for patience?! I’m SO in! Pinning to try! Cheers! You mention maple sugar in the directions, but have brown sugar in the ingredient list. You meant brown sugar for both – right? These ragamuffins look amazing. Thanks! Thanks so much, Holly and yes, I did mean brown sugar for both :) Thanks for letting me know about that. It’s fixed now! I loved the name before I even saw them but once I took a peek, I liked them even better! Love how easy these are Jennifer! I’m thinking these will be happening shortly at our house! Mmm Mmm Mmm! We love anything cinnamony! I will likely throw some raisins in there as well, Jennifer! Thanks for this easy recipe! It’s starting to feel more like Fall than summer already. Some of the maples are turning already here. Are they changing in your neck of the woods yet? I’ve even seen my breath a few times on my morning walks too..I love Fall, but summer sure felt short this year! Thanks Colleen and I am always drawn to cinnamon flavours, too :) Raisins would be lovely in these! And yes!! I saw a tree yesterday that was half changed already. Thankfully, it’s the exception still right now. But won’t be long. The summer here has been really disappointing. Tons of rain and not a ton of heat. I’m hoping for a lovely September. 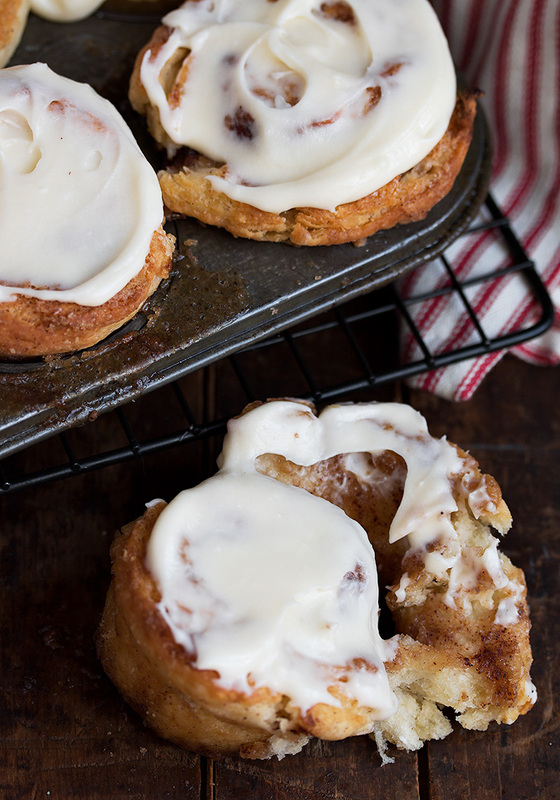 I’m all over this gorgeous treat, I love cinnamon rolls but can’t even think about doing all that work, these are just perfect! Oh boy these are gorgeous little sweets! I’m ready for fall baking and these fit the must-make criteria perfectly :) They look so flaky and the answer is yes … with the cream cheese icing please!